Think a shower is just a shower? 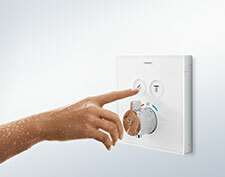 Take a shower with hansgrohe. You will be able to feel and see the difference: our showers gently douse, wonderfully refresh and vigorously massage. Thanks to the wide variety of overhead, hand and side showers, not to mention shower systems, you will have no problem finding the perfect shower for your shower area. Let yourself be pampered: make showering fun, with up to nine different jet types, countless shower sizes and award-winning designs. Find out all about the innovative Select technology that allows you to select jet types at the touch of a button. You will probably never want to shower any other way again. Our latest coup when it comes to jet type technology is the micro-fine PowderRain. With thousands of ultra-soft droplets, it envelops the showerer in a cocoon of water.